The story of Abigail is at essence, a response of a wise woman to a group of hungry men. Normally for make posts i try and come up with a fun craft but this idea has been bouncing around pinterest and i think it fits perfectly with the story. These have been called blessings bags, or homeless bags. They come with the simple idea that when you see the homeless you give them something little to help. If you live in a city then you may even be able to go out with some of the children and deliver some of these. Rather than simply put one together myself, which will be specific to my context, I’ve used photographs from other sites. Click on the photo to read their posts. 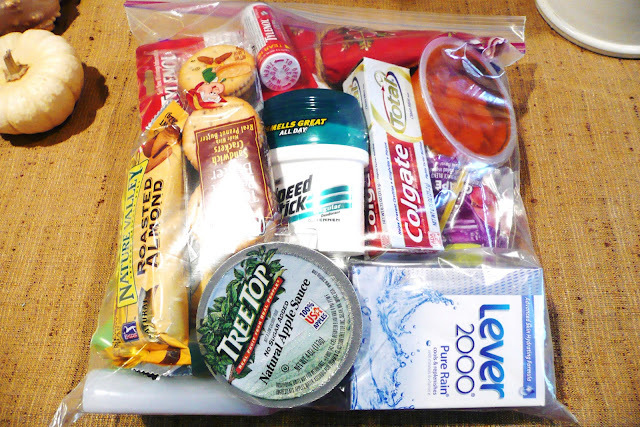 While it’s good to include some small food and drink in the plastic bag, basic essentials are probably the most useful. Wet-wipes, small bars of soap, deodorant, toothbrush, toothpaste, band-aids or plasters, cough-drops, lip-balm…. Finding a sturdy plastic bag is a probably the most useful way of giving the gifts to the people you meet, that way they can see what they are being given and you can spot if anything has been broken in transit. Try not to make the bags too large, adding weight to what these people have to carry may not be well received. Large bags also work out more expensive and more time consuming to fill. The last example I want to share has very few pictures but has a good list of ideas for the bags themselves. Buying things cheaply and in bulk, asking people to contribute, and keeping an eye out for things on offer can make these bags really inexpensive to make. Trial size and travel sized good are great too. You may want to include a small card or leaflet from your church in the bag. Some people have included tracts and bibles, I suppose this depends on your style but I would prefer this to be a wonderful act of grace, freely given and expecting of nothing in return.